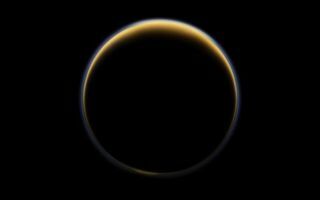 In this stunning space wallpaper, taken with the Cassini wide-angle camera on June 6, 2012, the spacecraft looks toward the night side of Titan and sees sunlight scattering through the periphery of Titan's atmosphere and forming a ring of color. In this stunning space wallpaper, taken with the Cassini wide-angle camera on June 6, 2012, the spacecraft looks toward the night side of Titan and sees sunlight scattering through the periphery of Titan's atmosphere and forming a ring of color. The natural color view of Titan was produced with images taken using red, green and blue spectral filters. A detailed analysis of data obtained with the Langmuir probe instrument, part of the radio and plasma wave science instrument on board Cassini, has confirmed predictions that the density of Titan's ionosphere is directly linked to the 11-year solar cycle. This image was released Oct. 15, 2013.